That was our reaction when given the number. First things first — we called a contractor for an estimate last week and they came out on Friday evening. Now, my wife and I like to buy things, we don’t like to be sold them. Why is it that every contractor has a seedy sales team? It’s worse than buying a car. I digress. 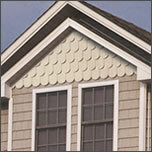 Plain and simple, we want vinyl siding. We want the little fish scales in the peaks, contrasting trim around the windows, a new front door, and a new basement hatch. That’s it. We don’t want 10 free windows. We don’t want free gutters. Don’t tell us what colour we should get. Don’t tell us that shutters are in style. Don’t tell us what we want. And don’t ask us to sign something. We *know* what we want, and we’re asking if you can do it for us and for how much. And don’t tell us that it will be hard to find the right size basement hatch or to install a specific door. We don’t care. We’re paying you to do it. I can’t imagine doing that in my job — offering something and then telling a client, “Well, that’s really hard to do.” What? On the bright side, they do good work. There are a number of homes in the area that they’ve resurrected from the dead and we’d really like to join them. On that note, they kept calling our house a “show piece”. One of the houses they recently completed is just up the road — and they took us over to oogle their house. Right around dinner time. That had better not happen with our house. I don’t want a “show piece”. And I certainly don’t want strangers walking around my house. Anyway, it was the bottom line that left us stunned — basically between $24k and $26k in total. Unfortunately, that’s about $10k more than we were prepared for. To finance the project, it looks like we’ll be using a few of those handy “convenience checks” that credit cards sneak in there on page two of the bill. Using those, our interest rate will top out at 4.9%, which is a lot better than the 15.5% loan we took out from Bank of America to finance the roof. It still hurts, though, to have just crawled out of the hole and instantly be buried under another 5 figure balance. We sided our house about 1.5 years ago. I also got multiple bids and looked at various types of siding. I ended up negotiating a much lower price than the original bid came back by pitting one against the other. I also told them I loved their product but it was out of my price range so I was seriously considering their competitor. I was able to side our whole house with real wood siding for $13,500. That’s for a 2700 sq foot 2 story house. Thanks for the comment and tip Hazzard! Love your site too! While I’d love to replace the damaged clapboard currently on the house and repaint to give it that authentic 1800’s look it deserves, preliminary research showed me that that was totally out of my price range. There aren’t companies around here that will do that sort of work — unless they call themselves “Restoration” experts, and apparently that adds an extra zero to the price tag. Vinyl has seemed to be the finish of choice in our area for years now. I’m not real keen on it personally, but it will be a great improvement over what we have now and most importantly, it should get us out of our horrible homowners insurance problem. Not a palace, it’s a modest 2 story house with around 1600 sq feet and a detached 2 car garage. We’re not having any work done on the garage as it’s so far gone, it doesn’t seem worth it. That, and it’s already too small for us, so it’s not a long term building for us. For the quote, yes, it is high. Last year we had another contractor come out and give us an estimate. They came in at around $14k — but that was barebones. For this project, I probably should have elaborated a bit more — in addition to the siding look we really want (smaller slats and with the fish scales in the peaks), we’re making our front doorway larger and replacing the likely original to the house door, replacing an old rear door, adding a stylized rounded window to one of the attic peaks, and installing a new basement hatch. So while the first estimate was a lot lower, it was essentially just wrapping our current house in plastic. This one, while higher, should make it look a lot nicer at the same time.